This is an article that is written in subjective manner. It is my personal view of Moscow. Beside my impressions, I will mention certain locations that I think are worth visiting and I will touch on some common misconceptions I read online about Moscow before my trip there. At the end of the article is a link to Google map that displays all the locations I mention in this text. I hope you'll find some valuable information for yourself in my Moscow story. 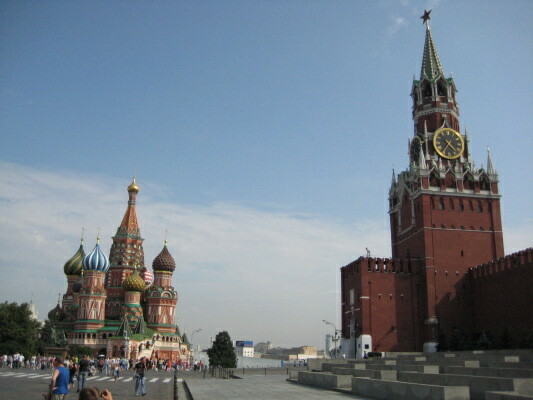 Moscow is the capital of Russian Federation and one of the largest cities in the world. Current official figures for number of residents and real figures are very different. When you get to Moscow you will see and feel that fact. Unofficially Moscow has almost 20 million people. Well at least that is what a taxi driver told me. City not only has large population but covers vast territory. 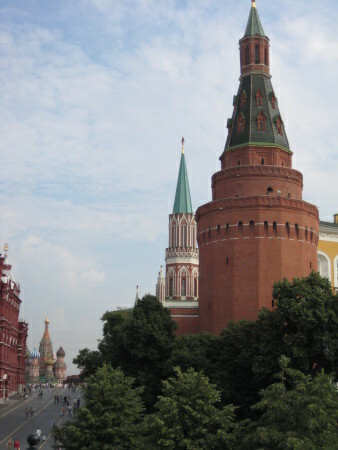 I visited several large cities in Europe, but Moscow is different. If you have a park in London, then such park in Moscow will be three times larger. If you have a monument in Berlin, it will be 10 times that size in Moscow. Sometimes this can look a little odd. Nice example for this is a monument to Peter the Great. While you will be exploring Moscow pay notice to this fact and when you, while looking at the map, decide to take a walk from point A to point B - pay attention to the map's scale. Don't repeat my mistake. The best way to reach your destination in the city is by subway. Definitely the best subway system I ever saw. It is really impressive. First of all, subway looks great and Muscovites are obviously taking good care of it. Second, the trains just keep coming. During several days I was in Moscow I never waited for a train more than 30 seconds. I was really surprised to see people running, trying to catch a train. It seems such a meaningless waste of energy. Another ride is arriving in 20 or so seconds. And finally it is cheap. You can buy single ticket or a card with ten tickets. A card with ten rides cost me around 3€. Taxi is also not very expensive, but in Moscow every car is a potential cab, so it understandable. If you stand next to the road and raise your hand at hip level a car will stop within few seconds. If the person is going where you are going, for a small fee, you got yourself a ride. But this type of transport is not something I will recommend to someone who is distrustful to strangers or doesn't speak Russian very well. You must explain to the driver where you want to go and you must, of course, negotiate the fee. In Moscow nobody speaks English. Well maybe one or two people do, but I haven't met them. People there only speak Russian. If you plan to travel to Moscow be aware of that. First I thought that not knowing the unofficial lingua franca is a sign of some oversight in educational program in Russia, but soon I realized that it is not that. Foreign languages are actually not important for Muscovites. Everywhere you go from Moscow for thousand of kilometers everyone speak Russian. Actually, there are many people in Moscow who arrived from other countries, mostly from Asia, who are struggling to learn Russian. So in Moscow, Russian is the language that different people from different countries and cultures use to communicate with each other. Moscow is truly a cosmopolitan city. Contrary to many tourist reports from Moscow I read on the Internet before going there myself, Muscovites are very friendly. I’m learning Russian language and when people see that you are a tourist trying to speak their language they seem to like that. Just like probably everywhere in the world. It, I guess, shows a certain level of respect for locals. But you shouldn't expect a special treatment from most of the people because you are a tourist. If you don't think of yourself as a prima donna, you should be OK. I roamed the streets of the city from the early morning until very early morning the next day and during all my time in Moscow I tried to engage in as many conversations as I can. I didn't have a single bad experience. I also traveled to Moscow suburbs, or at least I thought these areas were suburbs. I tried to see how people live outside of tourist zones and it doesn't look too bad. Again, from what I have read online from some tourists I expected something terrible. I found many large residential buildings with bars, shops and libraries on the ground floor and many newly constructed shopping centers. 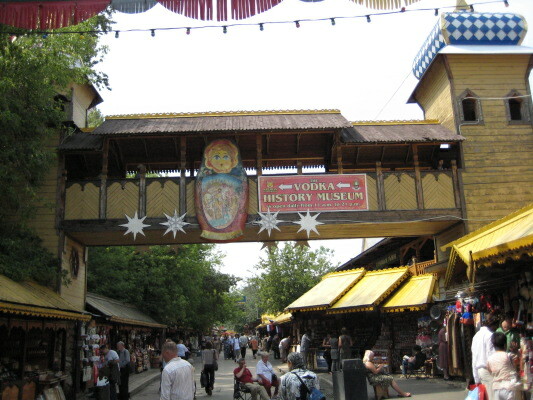 One of the places you shouldn't miss is Izmaylovo(Измайлово) market on the city's north-east (location). 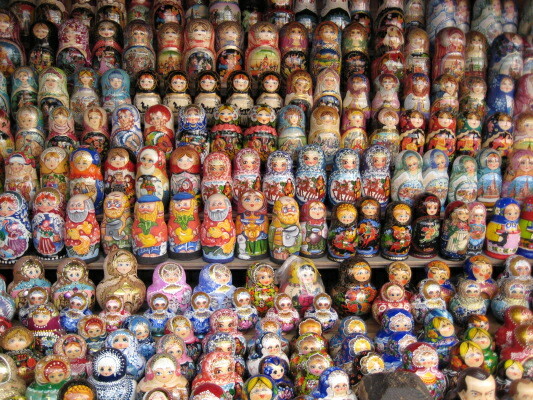 There you can buy all the Russian souvenirs you want. It is quite a long way from city center but it is located near Izmaylovo hotel complex, so it's a tourist friendly place. The subway stop is just next to the hotel complex, and from there is just a short walk to the market. Beside Russian souvenirs, that market is a great place to buy international music CDs or movie DVDs or music DVDs with MP3s or DVDs with six or seven DIVX movies, stuff like that, for 2 or 3 Euros. In Russia there is a very liberal understanding of the term "copyright" and it makes life for ordinary people so much easier and cheaper. 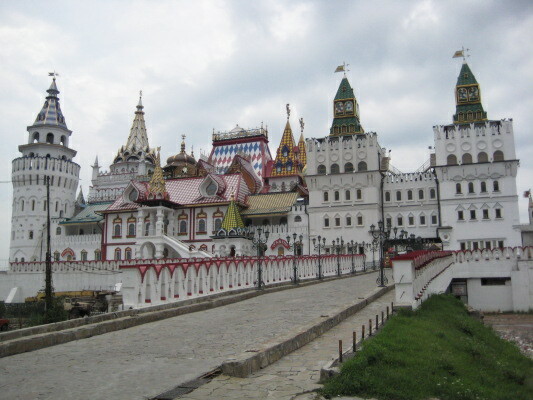 Also while you are there you can visit the castle that is next to the market which is newly constructed in old Russian style. There are several museums there, like museum of vodka or fairytale museum but I didn't have time to visit them. Nearby is also a historic complex with cathedral and old Peter the Great army barracks. 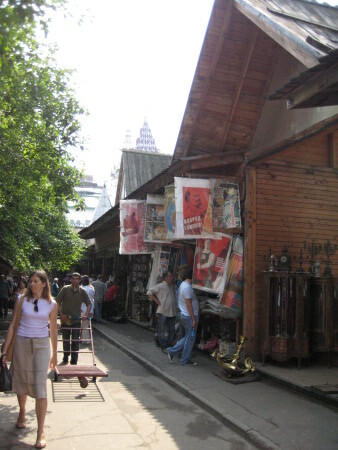 Another place to buy souvenirs is Old Arbat. It's a street in city center. 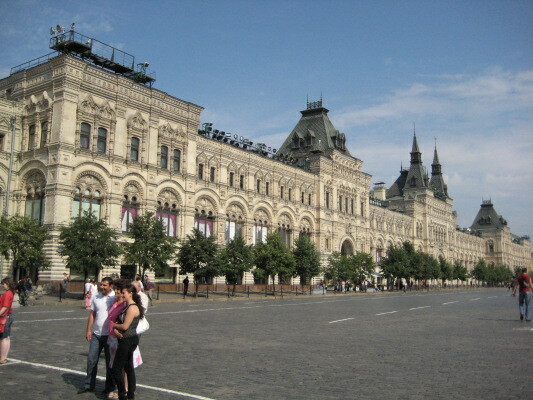 In my guide book it is said that Old Arbat is a great street flooded with tourists. I guess all the tourists are there because it is written in their guide books that they should be there. When I was there they were reconstructing the street so there was nothing to see. It's just a street with restaurants, several stands where you can buy trinkets and a McDonalds. Also the prices in restaurants and prices for the stuff you buy there are a bit higher than in other places. By the way, average meal in restaurant will cost you around 12-13€, but you can stumble upon a place where you can get good food for even less money. When I was in Moscow I had the luck to have a great tour guide who knew to point out a few good places to eat. I could find those places again, but I have no idea how to explain to you where they are located. And one more thing, don't forget to try borsch while in Russia. I tried it the first day and immediately got addicted. Another vital source of nutrients, beer, costs around 2.5€ for half a liter. Cigarettes, which are of course bad for your health are very cheap. If you are one of those people that must buy a pack now and than, a pack of Marlboro should cost you around 1.5€. Russian brands are also good and are much cheaper, half a Euro or something like that. I don't really know if there are any dangerous neighborhoods in Moscow but I never felt any problem. Of course, that can mean that I was just lucky. You should always pay attention in a strange unknown big city, but if you don't wave your passport around and if you try not to look like a tourist, probably no one will bother to ask you anything. I guess that kind of behavior allowed me not to talk to any police officer in Moscow. The only police officers I met are in one of the pictures on this page and we never talked. But on the other hand, I know some people who did get into trouble with the police. Don't try to cross the street in Moscow center where you think it is convenient for you. Crossing the street in Moscow center is something that requires planning. You will most of the time cross through underground passages and that is good. Cars are driving at 100 km/h through the center of the city and if you decide to cross the street at an unmarked spot, prepare to run. And watch out for the police. Those people I mentioned made a little mistake and were taken to police station. After a little while and after a short, and from what I have heard, a pleasant chat, they were released. No bribes were necessary so this fact opposes another common story told online to future tourists to Moscow that police officers stop tourists to harress them and ask for bribes. OK... enough of my impressions of the city as a whole and people in Moscow. In short, Moscow is normal big city with normal people living there. If you open your eyes and see what other people are doing you will soon blend in. It might look a little strange that I showed my Izmaylovo photos before the main attractions. Someone may think that I obviously messed something up here, but I believe that when you visit a new city you should try to see how real people there live. The attractions, probably already familiar come second. Let's talk now about the areas for which Moscow is recognizable everywhere in the world. Well, the center in where Red Square (Красная площадь, Krasnaya ploschad) is. 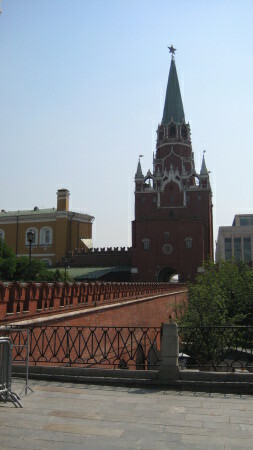 To reach Red Square you will probably exit the subway on Manezhnaya ploschad. Next to Red Square is Kremlin on one side and GUM on the other. I read in my city guide that GUM is a fancy shopping center with luxury stores so I didn't enter it. The other two sides of the square are closed with History museum from the north, and Saint Basil's Cathedral from the south. 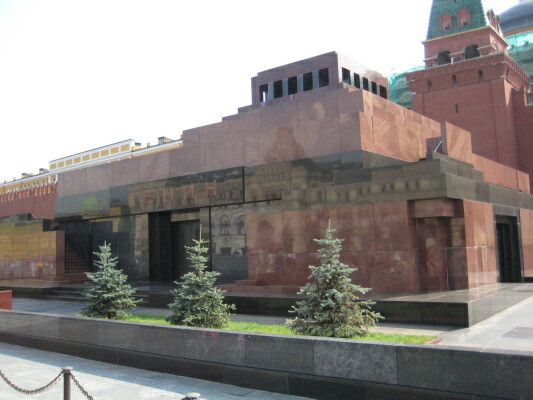 Lenin Mausoleum is located just under the walls of the Kremlin. 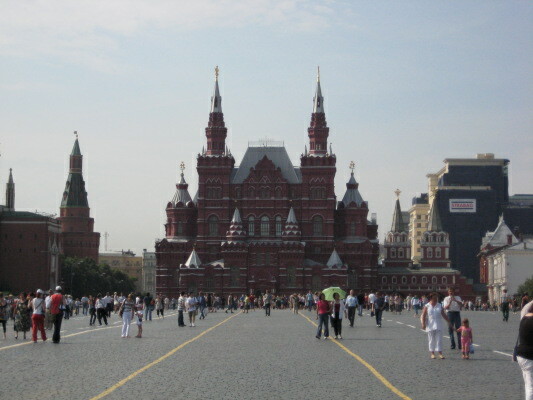 The thing that surprised me was to discover that Red Square is not really that big. This was also one of my misconceptions. But the Kremlin is a different story. It was much bigger than I imagined. To enter it, you need to buy tickets. It takes some time, an hour or so. Some things in Russia just take time. That makes previously mentioned running to catch a train even more absurd. 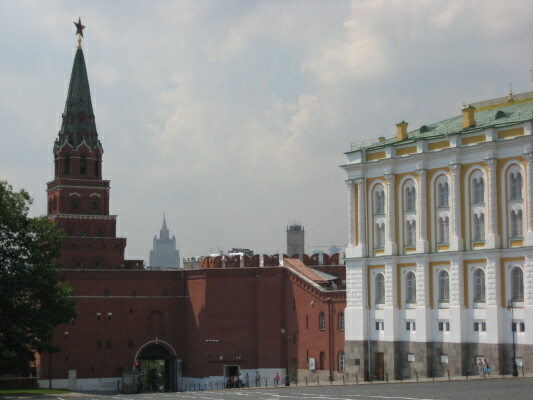 After you buy tickets you will enter the Kremlin and you will discover a really beautiful place well worth visiting and waiting for the tickets. Beside many beautiful and special churches there are also several museums. 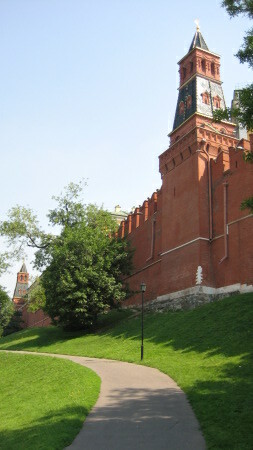 I visited Armory museum inside Kremlin. I'm not a big fan of museums, but inside this museum you can really get the taste of the Russian history. 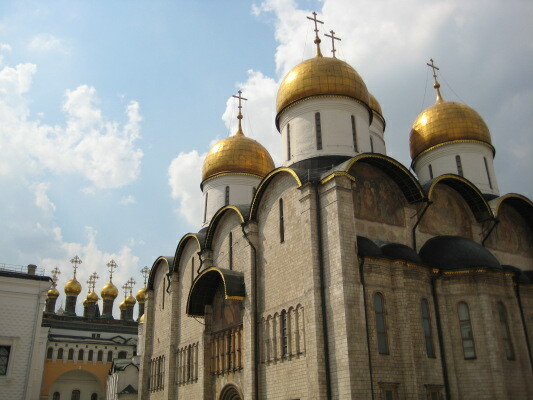 While at Kremlin take time to visit some of the beautiful old churches located there. 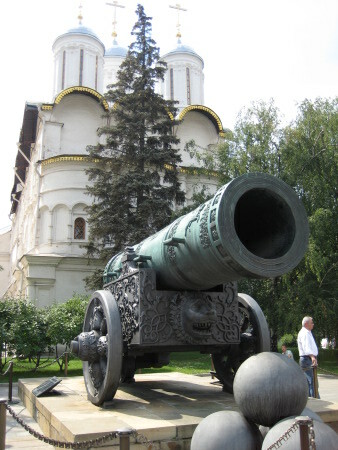 Also you can see the Tsar Cannon, the largest howitzer ever made, and Tsar bell, the largest bell ever made. Tsar Bell is broken. Unfortunately I wasn't able to photo a broken side of the bell because the place was packed with tourists. 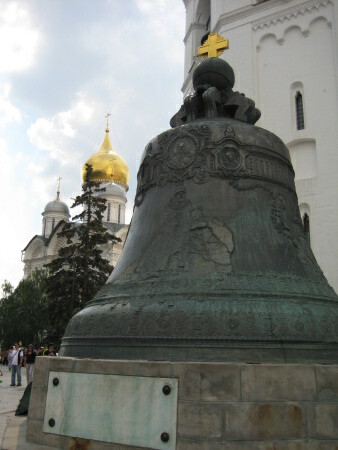 On this page you can see many of the sites in Kremlin and the broken side of the Tsar Bell. I would like to mention just one more thing about Kremlin. Pay attention to security guards there. 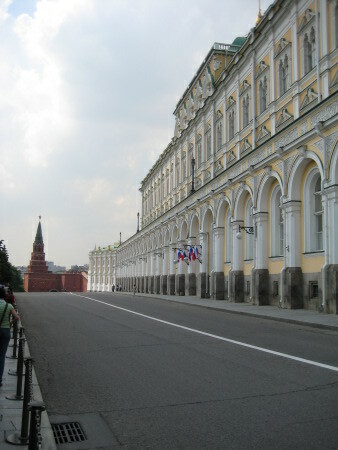 Kremlin is the seat of the Russian government and Russian president so you can't just wander around. Some areas are off limits for the tourists. 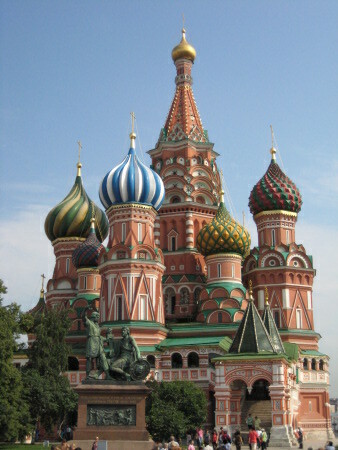 In the central area of Moscow there are a few sights I would like to mention. One is the Cathedral of Christ the Savior on the bank of river Moskva. 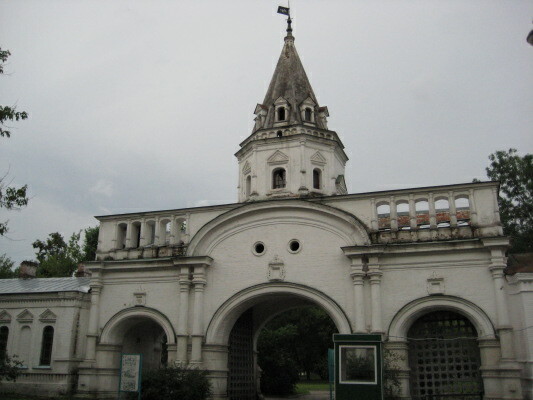 It was built in 19th century and then destroyed with dynamite on Stalin's order. 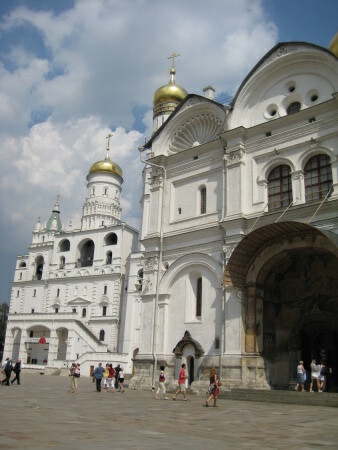 After the fall of communism, the church was rebuilt. While you are near the Cathedral, look across the river and you will see the monument to Peter the Great. After a day in the center, the next day I decided to go west. I went to visit the World War II memorial center. 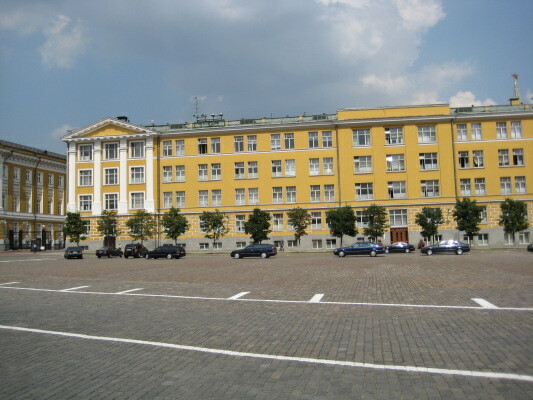 It is a large complex with World War II museum and nearby Weapons museum located on Kutuzovskiy avenue. Number of weapons in Weapons museum is impressive. There are more airplanes in the museum, than in many world's countries air forces. You can see a lot of weapons from World War II but also some modern aircrafts. When you return to Kutuzevskiy avenue you will have a nice view of Triumphal arch constructed in 19th century to celebrate the victory of Russian troops over Napoleon. While returning to city center I decided to walk. Not a very good decision. I marched for an hour on an avenue with almost nothing interesting to see. I only managed to catch a glimpse of new World Trade Center under construction. My long walk ended on Kiyevskiy vokzal with a view on one of the Seven sisters. Seven sisters are seven skyscrapers built by Stalin when he came to the conclusion that there are not enough skyscrapers in Moscow. This one now houses the Ministry of foreign affairs. Just behind that building is Old Arbat, the street I already mentioned before. Third day of my visit I went south. 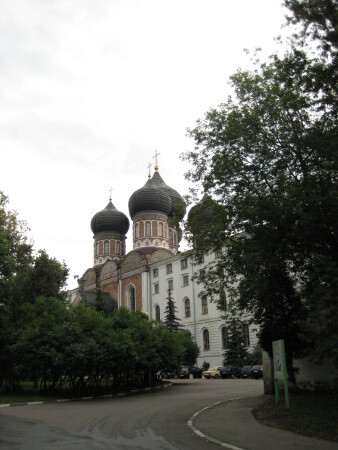 First I went to visit Novodyevichy monastery. This monastery founded in early 16th century is an UNESCO World heritage site. It is a nice place to visit. Next to the monastery is a Novodyevichy cemetery where many important people from the Russian history a buried. After visiting this second World heritage site (Kremlin is one also), it would be a shame no to visit the third one located in Moscow. I went to Kolomenskoye. It takes a short walk to the south to get there from Kolomenskaya subway station. When you get there you will find a beautiful park with many historic buildings. One of those buildings is the Ascension church from early 16th century. Also, this is great place to grab a beer and relax for a while. To bad that when I was there the weather was not so great, but it provided me with a cool photo of the Ascension church. My next stop that day was Tsaritsino - former royal estate of Catherine the Great built in 18th century. It is much further to the south but only three metro stations away. So in 10 minutes you're there. Now, this area is what I think is a real Moscow suburb. When you leave the metro at Tsaritsino station, you will be next to the market. You will have to pass under the railroad and suddenly the scenery changes. You will find a really posh park. When I was there, there were also several wedding parties with bride and groom being photographed in this fairytale ambient. Well worth the visit. Not only to see the royal estate and park but also to catch a glimpse of Moscow suburbs. For my last day a decided to give north and east a chance. I was already in Izmaylovo market which is also to the east, so I decided to move around the east part of the city center. I took a walk through Kitay gorod to the Chistiye prudi. This part of the city is very nice with small cozy streets and nice parks. During my lunch at one of nice restaurants in the area I read in my guidebook about VDNKh and decided to visit it. After a short walk to the metro station I passed by the former KGB headquarters in Lubyanka street. VDNKh is up north. It was built as an exhibition center to celebrate achievements of communist Soviet state. 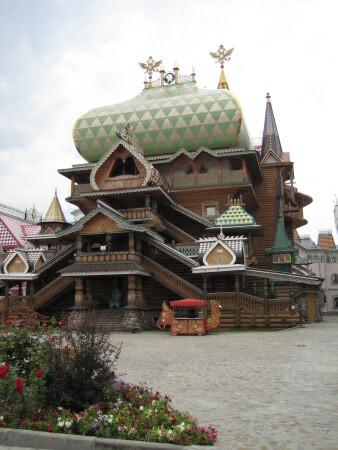 It consists of many pavilions, each dedicated to one of the former Soviet republics. There are many statues of golden workers and peasants as well as many other monuments to great successes of communism. Today, ironically, it is converted to a large shopping center where you can buy almost anything. This was also another great place to greatly upgrade my music collection for couple of Euros before leaving Moscow. My trip to Moscow ends. That evening I left Moscow by train to visit St.Petersburg (report will be online soon). Moscow made a great impression on me. Everything in this city is monumental. It is a huge city where all the streets, city squares and parks, streets and many monuments gave a strong feeling of history, dignity and power. Moscow moved very far away from the communism but is not ashamed of that period of their history, unlike some of the former communist countries in Europe. The mistakes of former system and leaders are recognized and corrected, like in the example of the Cathedral of Christ the Saviour. Today Moscow is an enormous construction site. New buildings or even city blocks are being constructed and old historic monuments and city areas are being rebuilt. No other city I visited was anything like Moscow, and I can certainly recommend to anyone a visit to this magnificent city that never sleeps.